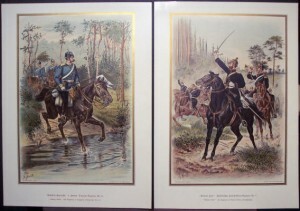 Description: Pair of Prussian Military Original Stone Lithographs by the Werner Co. of Akron, Ohio, 1899: 1. 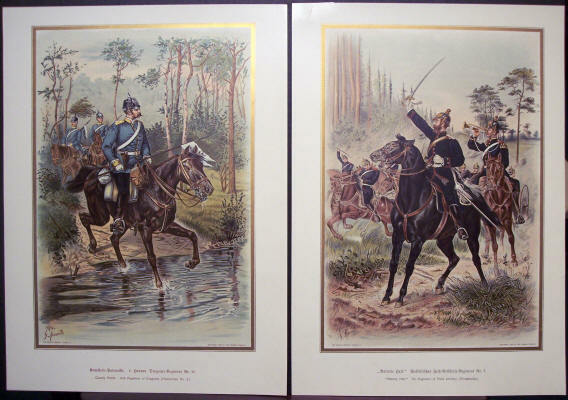 “Cavalry Patrol, 16th Regiment of Dragoons (Hanoverian No. 2)” and 2. “Battery Halt, 7th Regiment of Field Artillery (Westphalian).” “Cavalry” measures 15 3/4″ x 11 5/8,” and is in very good condition. “Battery” measures 15 7/8″ x 11 1/4,” and has a 7/8″ repaired tear in the upper left-hand margin.